'Boring' Singapore City Photo: Biten by an ant? Oh, what a holey leaf! We shall enjoy nature for the next few days. 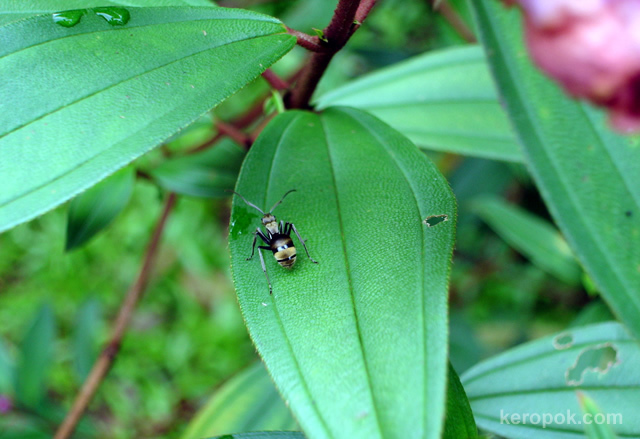 Here's a big ant on a leaf. Yes, the pictures these few days were taken from a green jungle in Singapore. Located at MacRitchie Reservoir Park, a few friends, we went for the Tree Top Walk. superbe macro, tres belle photo. superb macro, very beautiful photograph. Brings back fond memory of my x-country rans... thanks. This is a colorful ant. Our ants are either solid black or solid red. The shades of green are vibrant, and that's a big ant!! Has the crowd eased ?